Photo by Bruce Palmer. Amos Dickey is the implicitly trusted keeper of the keys at Devoe Moore’s Tallahassee Auto Museum, where he maintains a vast collection of vintage cars in running condition. Dickey first went to work for Moore 52 years ago and has no plans to retire. Amos Dickey shared with me a story about the time he confounded his boss by changing the lock on a door behind which he carried out a little activity that he intended to remain unseen. I am not at liberty to tell that story. Mr. Dickey beseeched me to leave it alone, said he would do anything for me in exchange for my agreement to respect his wishes. It momentarily occurred to me that I might be able to work him for a Batmobile, but I merely assured him that his secret was good with me. His manner and kindness were such that I was powerless to cause him any consternation. 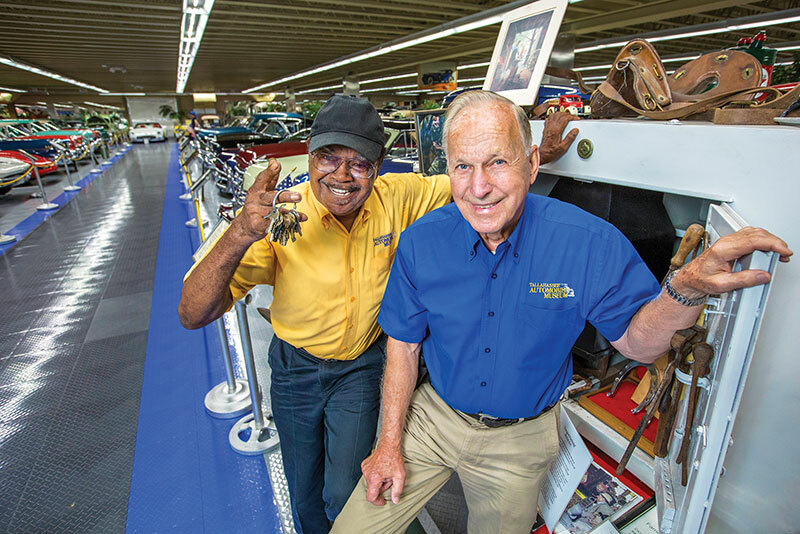 Dickey has been Devoe Moore’s right-hand man at the Tallahassee Auto Museum — the home of several Batmobiles — since the place opened in May 1996. And, for decades prior to that, beginning 52 years ago, Dickey worked for Moore reconditioning brakes and clutches for resale. He had an innate affinity for the work; as a kid, he was his neighborhood’s bicycle mechanic. Dickey was doing mechanical work for Elberta Crate & Box Co. near Lake Jackson when a manager there suggested that he might improve his lot by speaking to Moore. Dickey is not the type of man to change jobs without provocation, but when he learned that the often absent chief mechanic at Elberta was knocking down $2.85 an hour to Dickey’s $1.85, he had all the motivation he needed. Eventually, in 1994, health issues including a blood clot that had lodged in his neck forced Moore to get out of the parts business, which survives today as Fleet Supply on State 20. Doctors deemed the job too sedentary and prescribed that Moore stay on his feet and remain active. The prescription worked. work on dump trucks and clutch repairs, until the museum opened. Always, he has been trusted to open the museum when Moore is away and, says the boss, he is unfailingly on time. The place — apart from Moore’s office — is immaculate thanks to Dickey’s efforts and, remarkably, all but one of the 160 (or so) cars on display cranks when you turn the key. They include a Duryea Motor Wagon powered by an 1892 prototype engine. “The Studebaker was made to look like a Tucker and they used it in stunts and it’s all bent up,” Dickey explains. Dickey has the key to everything, Moore points out, including the cash register.